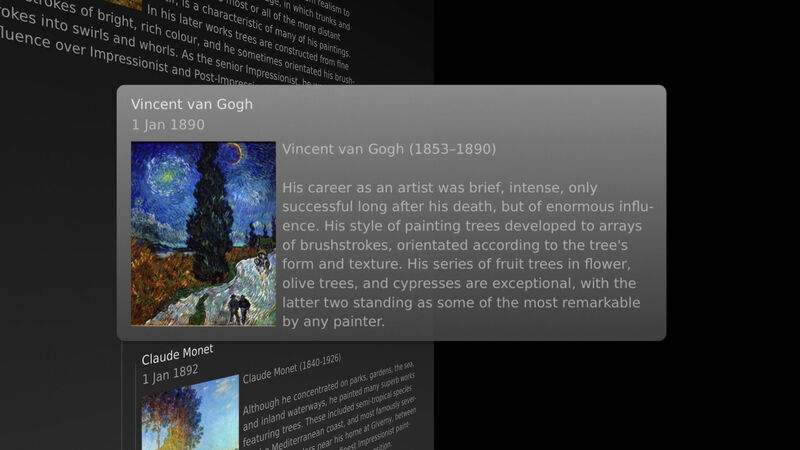 The first and simplest of the apps which I have used for creating media-rich timelines is Timeline 3D, which I briefly covered earlier. Free from the Mac App Store, you need to make in-store purchases to enable its rich export features. Unless you are on a very tight budget, the full unlock seems excellent value for £18.99. To some degree, Timeline 3D is a one-trick pony, but in the most wonderful of ways. 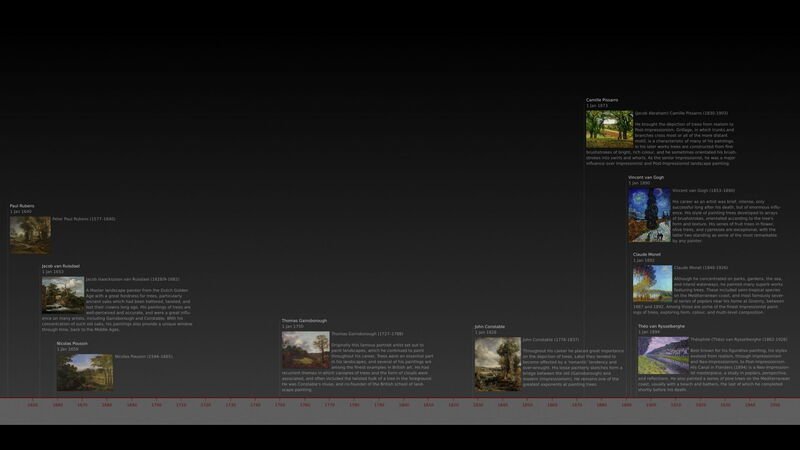 You can customise much about the appearance of your timeline, but its underlying format is fixed: it consists of a whole-timeline overview; then when you select any event or item from that timeline, that zooms into view as a hinged page, with the rest of the timeline turning into the background. Entering the data for each event is quick and simple. Click the + button at the top left of the window to add a new event. Give it a title, start date and optional end date (which can be displayed in custom formats), drag and drop any image, and add the text which you want to appear next to the image. You can assign events to colour-coded categories, include weblinks, and tags. 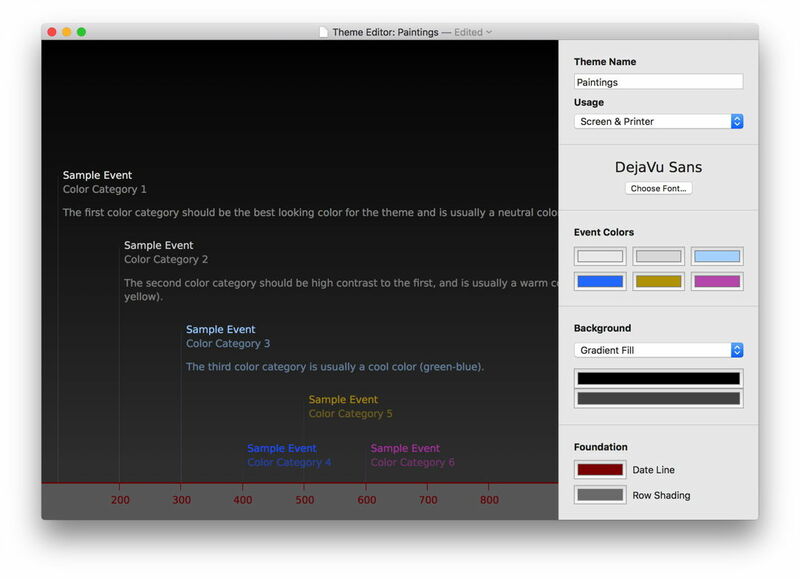 The appearance of the timeline and its events is set by themes, which can be set separately for screen and print. The standard themes are very pleasant, but here I have set up my own custom theme for this example. 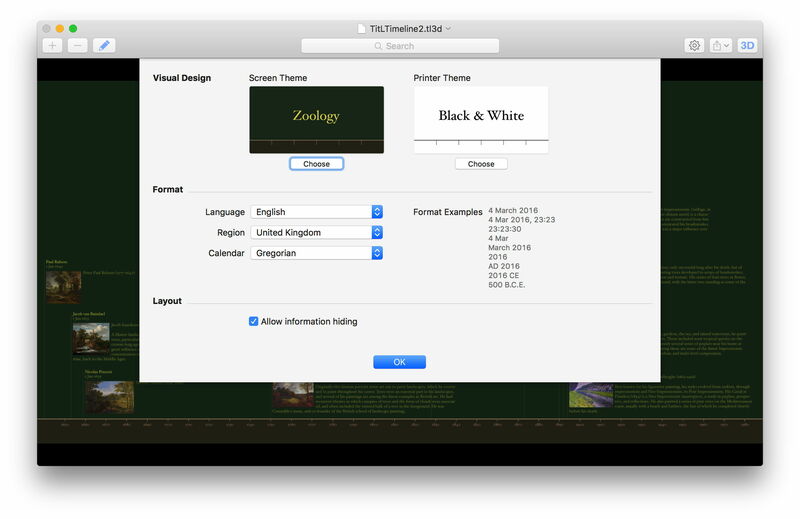 The theme editor gives you control over font, colours, and the background, for which you can use an image if you wish. One slight niggle with the current underlying format for timelines is the way in which it handles period events: these are marked at the start, with the period dates given, but there is no continuous bar extending to the end of the period, neither is the end marked. I will suggest some good styles for showing such periods in a later article. Once you are happy with the ingredients for your timeline, click on the 3D button at the top right, and the timeline will be generated ready for viewing. As I warned in the first article, Timeline 3D is only as useful as its export options. Thankfully these seem to cater for almost all requirements, including print, presentation, and web. 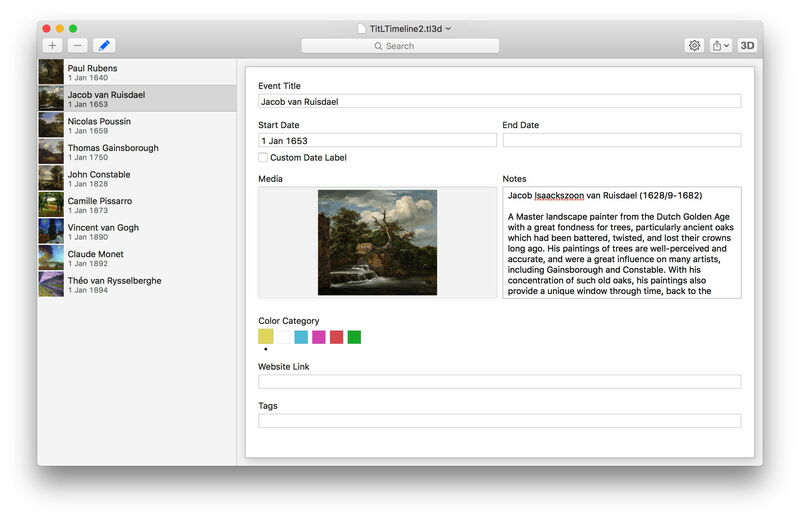 Exporting to PDF (or print) generates a single large page of the whole timeline, as seen in its main view. Because you can use a different theme more suited to paper, including a different font as well as black/colour on white, this is eminently usable and useful. Exporting to a movie gives you a wide range of formats, ranging from iOS devices up to full 4K. The resulting movie starts by showing the whole timeline, and then steps through each event in time sequence, with lovely smooth animation. For standalone presentations I think this would be my first choice because of its excellent quality. You can export the timeline in PowerPoint’s native PPTX format, which is also fully accessible by Keynote. The standard output then features the whole timeline as the first slide, and each subsequent slide shows the events in time sequence and close-up. For the diehard presenter, this is again a lovely result. Exporting to images simply generates the same sequence (whole timeline, then each event in order) into JPEG files at your chosen resolution. These would be suitable for embedding in other presentations, websites, etc. 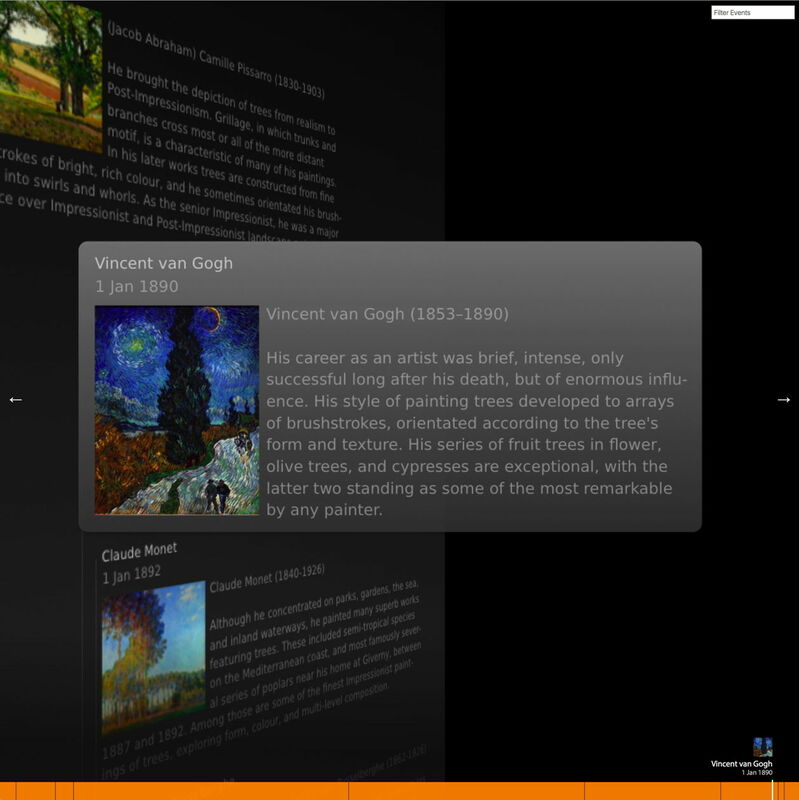 There is a great deal to like about Timeline 3D, if you like the way that it presents its timelines. If you use timelines anywhere, I recommend that you install it, try it out, and see whether you get on well with it. If you like its approach, you can then purchase export options to make it truly productive. Posted in General, Macs, Painting, Technology and tagged chronology, history, narrative, sequence of events, time, Timeline, Timeline 3D. Bookmark the permalink.